GLEN SANDER HAS taken his One Piece Billet Bird Cages one step further by offering a 2 bearing design. 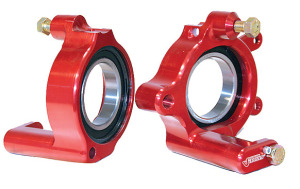 The extra Bearing eliminates bearing bind and Bird Cage Clevis misalign ment as your car rolls through the corner. All other pickup points are the same as the standard units and also have the level bubble built-in. CNC Machined, Red Anodized Finish.